A grey Lamborghini Huracan Performante, which has a top speed of more than 200mph and can reach 60mph in 2.9 seconds, skidded out of control after a “Supercar Sunday” event in Greater London. Video footage (below) showed the driver revving the car’s engine and then accelerating away. They soon lost control as the car veered towards parked vehicles on the right before spinning more than 90 degrees onto a pavement and smashing into a wall and tree. The supercar, which sells for upwards of £215,000, was left crumpled with smoke pouring from its rear. Its mangled wreckage was later lifted on to a recovery vehicle at the scene in Victoria Road, Acton. 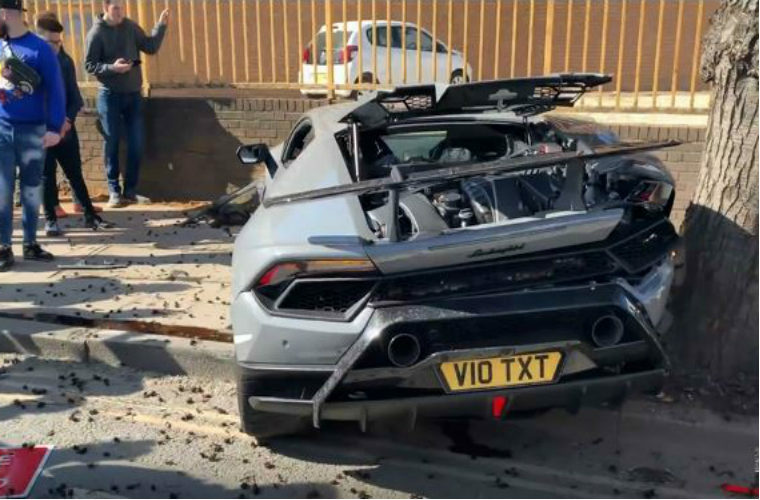 Thomas Melsens, 26, who filmed the crash for his Supercars on the Street YouTube channel, told the London Evening Standard: “It’s sad to see such a beautiful car go to waste. “Visibility was good but the road was dusty — that might be why he lost control – it’s fortunate no one was hurt. Police confirmed they were called to the event, organised by local supercar dealership HR Owen, at 1.20pm, Sunday, 24 March. No one was injured and no arrests were made. An HR Owen spokesman said: “We are concerned to hear about the accident which happened to the car on its way home after it had left the event.